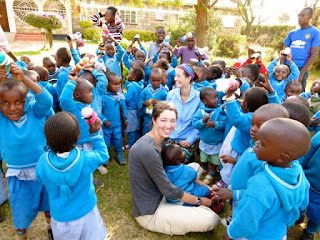 We only have 2 weeks left in Kenya! Time has gone by very quickly. We have continued visiting the nutrition study farms. 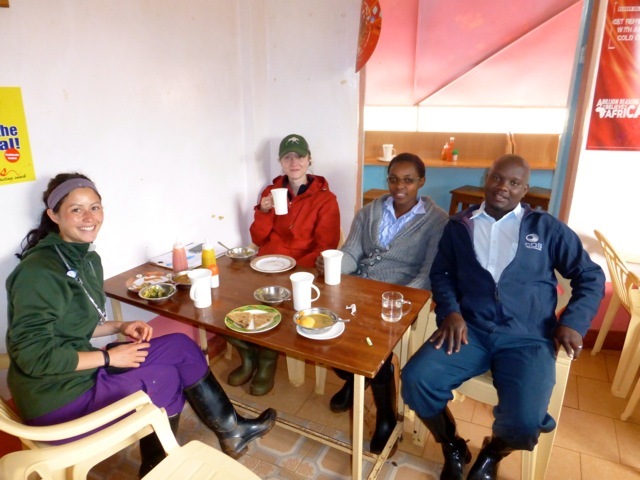 This past week, I (Sarifa Lakhdhir) spent time in Naari with two veterinary students from PEI who are representing Farmers Helping Farmers (Emily and Krista) and two Kenyan veterinary PhD students (Joan and Dennis). 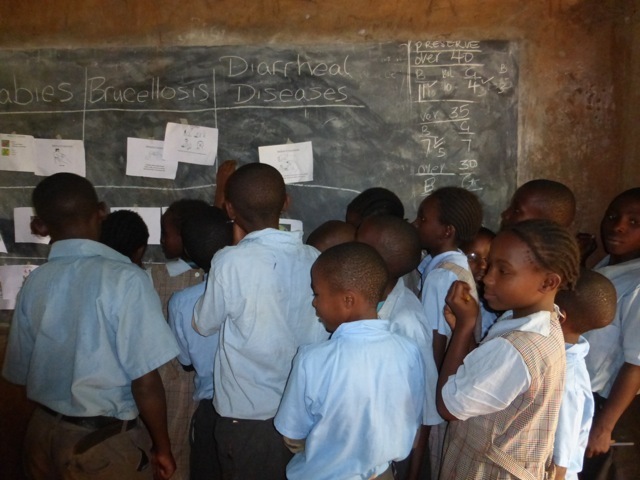 They are all starting a project in Naari similar to the one we have been working on down here in Mukurweini. Our project has been of great benefit to the dairy farmers in Mukurweini, and that is the reason for starting the same type of project in Naari. We visited several farms during the week. 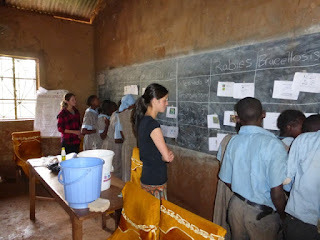 Normally the PhD and veterinary students would have a guide from the dairy to help them locate the farms in the study. On the first day of my visit however, the Naari Dairy was having a general meeting and all farmers and dairy employees were required to attend. Thus, we were left to find study farms on our own. We managed to find the first farm and after we were done, we asked the farmer for directions to the next farm. This worked fine for the first few farms. But we had quite a time locating one farm in particular. 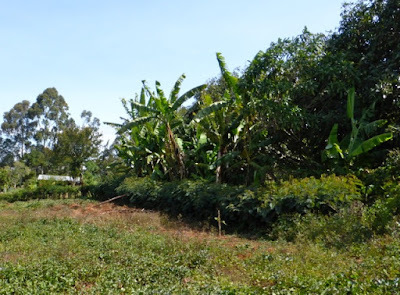 It was only after we had hopped around three farms that we managed to get to the farm that we thought we were looking for. Upon arrival, we found out from the farmer that we were at the wrong farm! The mix-up occurred because this farmer’s name was the same as the name of the farmer we were looking for. So we were back to square one! Looking for these farms while driving on dusty and bumpy roads definitely did not help! After the exhausting search, we found the farm and managed to examine the animals there. Thankfully we had a guide for the rest of the week. 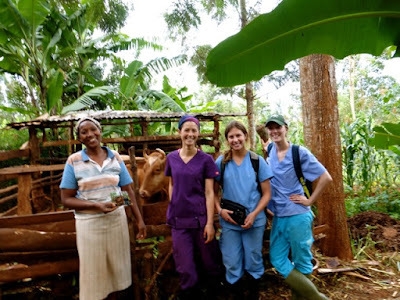 At every farm that we visited, we performed a physical exam of each and every cow and calf, recorded some identification information for future visits, and collected some baseline data. 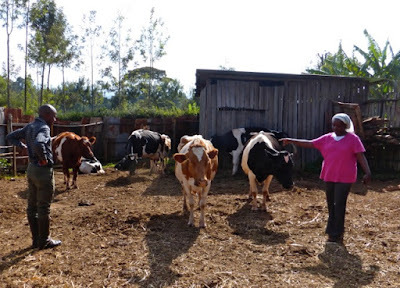 The number of cattle on the farms varied from as few as 1 to as many as 10. I got a lot of practice drawing blood and performing rectal palpations! The farms contained a mixture of both grazing and non-grazing cows. Many of the non-grazing cows were tied via rope to a stake. It felt like a rodeo trying to corral and restrain them! 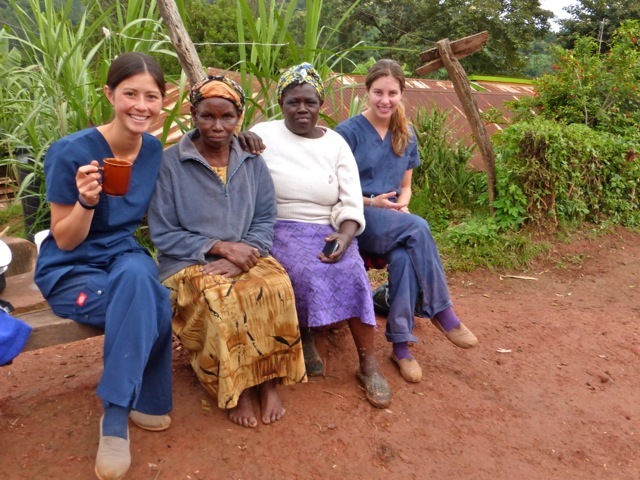 Enjoying tea, eggs, and “malaria oranges” with a farmer. Malaria orange is a fruit thought to prevent malaria if eaten regularly. It tastes like bitter grapefruit with a lasting aftertaste. I think I’ll stick to the malaria pills! Left to right: Dennis, farmer, Steven (our guide), Joan, Emily, Sarifa, Krista. I also had the opportunity to attend to some interesting veterinary cases during my time in Naari. During one visit, we examined a cow that had a growth on part of her eye. It was a squamous cell carcinoma of the third eyelid. This is a cancer commonly found in cows, especially those with sun exposure. In most instances, it does not hurt or harm the animal in any way during the early stages. 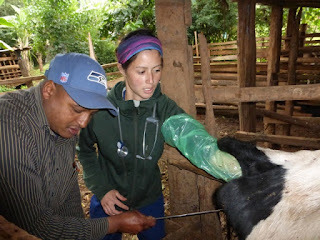 Treatment is surgical excision of the affected tissues when the growth becomes invasive and causes discomfort to the cow. 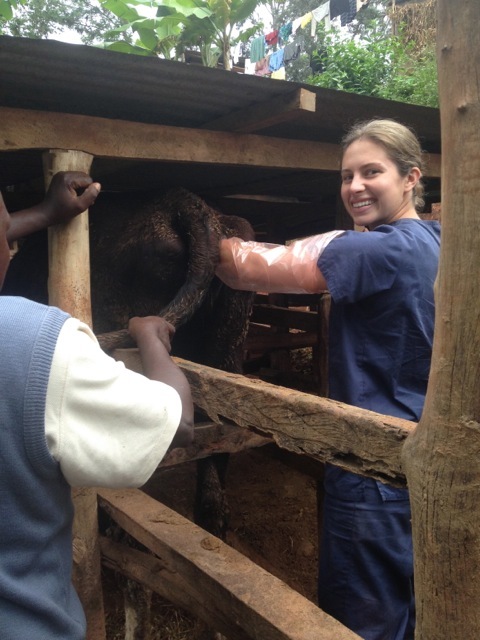 In this case, the cow was still behaving normally and there was minimal discomfort associated with the growth. Thus, we did not need to perform surgery on her during this visit. Another cow we visited had metritis, an infection of the uterus. The cow had recently given birth but had not immediately expelled her placenta. So someone had manually pulled it out of her. In cows, it is best to leave retained placenta alone and let the cow expel it herself so long as she is still behaving normally. Pulling out the placenta can harm her reproductive tract and introduce bacteria into it. In this case, the cow had pus in her uterus due to the infection. Thankfully, within one week of treatment, the metritis had improved drastically! 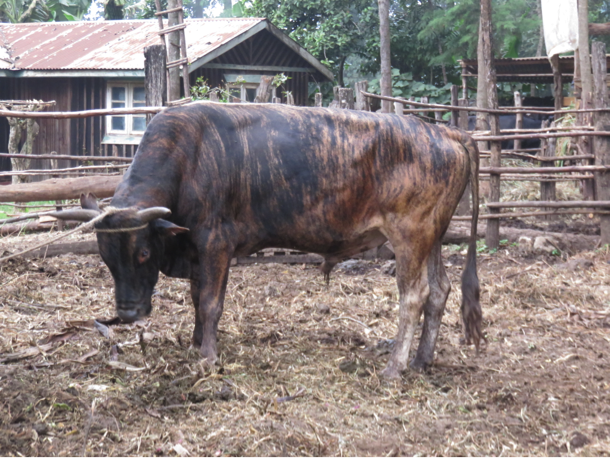 Zebu bull in Naari. Cattle in Naari tend to be more of the local Zebu breed. 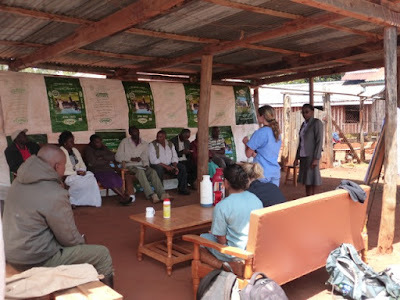 Over the weekend, two Kenyan members of Farmers Helping Farmers, Salome and Steven, took us to visit some interesting places. On Saturday, Steven took us to some farms to show us screen houses and greenhouses. 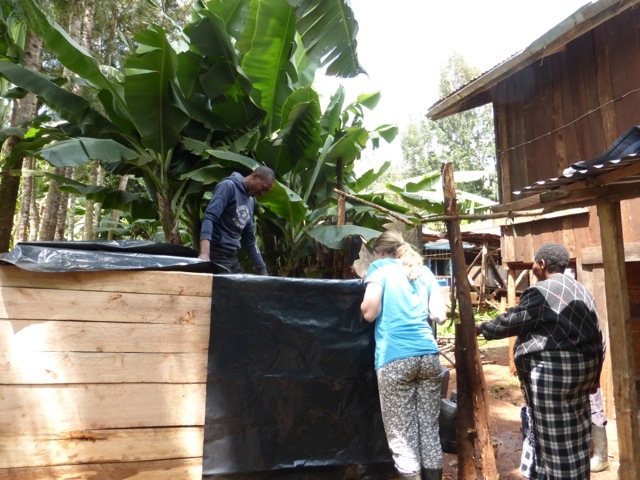 Many people in the Meru area, with the help of Farmers Helping Farmers, own either a screen house or a greenhouse and use them to grow crops, especially tomatoes. Steven explained that a screen house is an area enclosed by screen cloth. Air can freely pass through the enclosure, and the temperature inside varies with the temperature on the outside. On the other hand, a greenhouse is an area enclosed by plastic sheets. The temperature inside the greenhouse tends to be higher than that on the outside, and this allows crops to grow much faster. 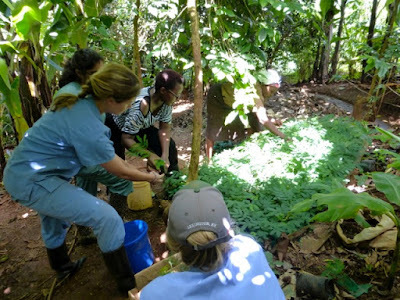 The downside of a greenhouse is that any disease brought in will tend to stay inside the enclosure and spread rapidly to all the other crops. I found it interesting that tomato plants planted in screen houses must be grown and maintained differently than those planted in greenhouses. 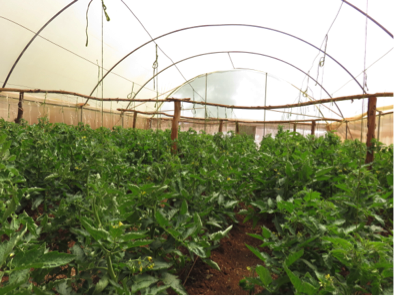 Due to the accelerated growth in greenhouses, it is essential that only one main stem of the tomato plant is allowed to grow vertically up. All side branches must be trimmed down regularly. 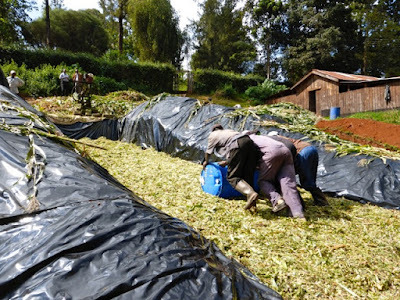 Once the stem has grown tall and matured, it is laid flat onto the ground and a new stem is allowed to take its place vertically. This process controls the growth of the tomato plant. 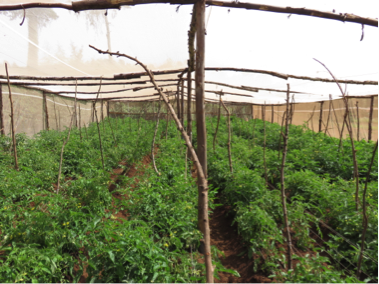 In screen houses, tomatoes grow much slower and because of that, less maintenance is required as the plant will not be able to quickly reach the size of the plant grown in a greenhouse. Screen house (top) vs greenhouse (bottom). Notice how the tomato plants in the greenhouse are bigger than those in the screen house. 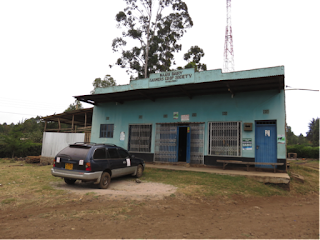 Later in the day, Salome and Steven took us to visit the Muchui Women Group Business Centre. This group of women grows crops such as tomatoes, kale, beans, and an assortment of trees to sell to the community. There are now around 110 women who are part of this group. I was impressed and very happy to see how this initiative has helped to empower women in the community to work together to make a living in order to support their families. Visit to the Muchui Women Group Business Centre. 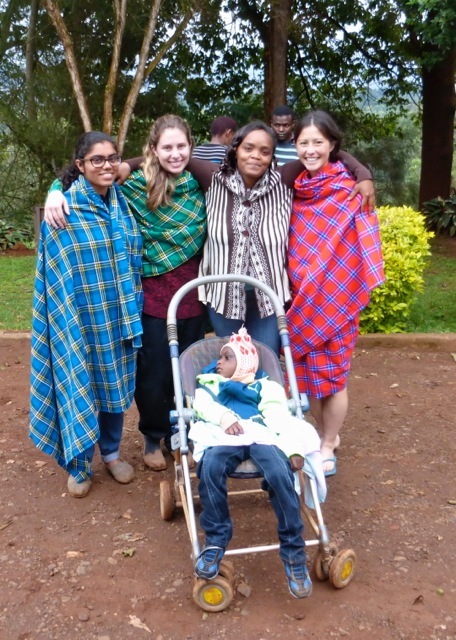 Left to right: Steven, Krista, Emily, Salome, Sarifa. 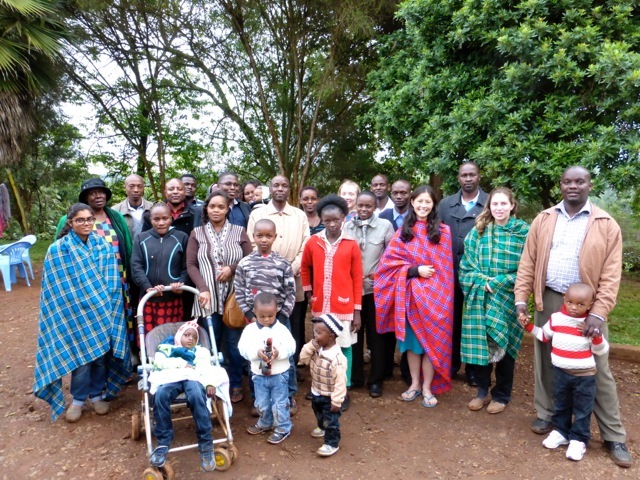 On Sunday, Salome took us to visit the Ngare Ndare Forest Trust. We hiked along the Ngare Ndare river and visited some waterfalls and springs. The river has about 11 springs along it. These springs are often visited by elephants looking for a drink or just to cool off. Elephants will tend to slide down steep banks to get to the springs! Salome had packed us a wonderful lunch of chapatis (baked flattened dough), cabbage, and chicken, which we all enjoyed sitting beside one of the springs. 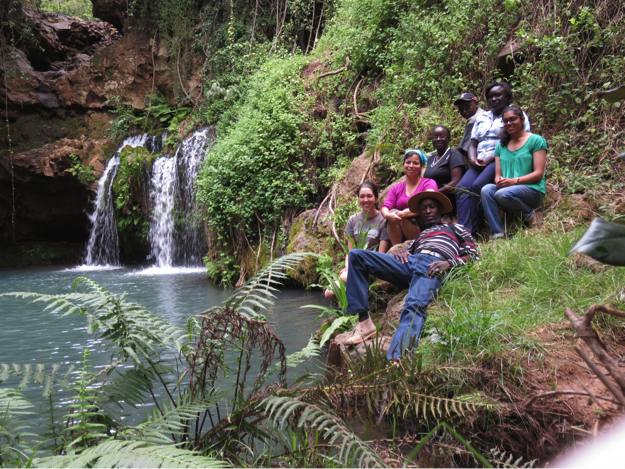 Group picture by one of the springs of the Ngare Ndare river. 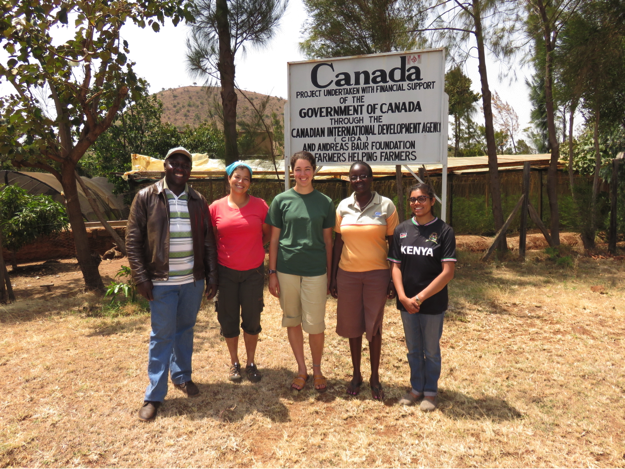 Left to right: Emily, Krista, Charles (our driver), Salome, Zablon (our guide), Carol, Sarifa. In the afternoon, we went on a canopy walk. This canopy was built in 2007 and is 500 meters long! The view from above was breathtaking. On our drive out of the forest, we had to cross the river in our car. Thankfully we had a four-wheel drive and the river was only one foot deep at that point! We also passed under dangling live electric wires. I came to learn that the wires are strategically positioned above the roads to keep the elephants from crossing into areas inhabited by people. 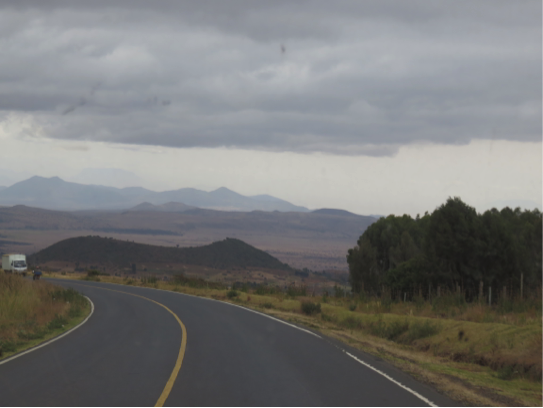 On our way back to Meru, we drove through the Lewa Wildlife Conservancy. We saw so much wildlife along the way, including giraffe, lesser kudu, ostrich, and even a rhino and its calf! The mini safari was a great end to our productive and adventure-filled weekend. Beautiful drive to and from the Ngare Ndare Forest. 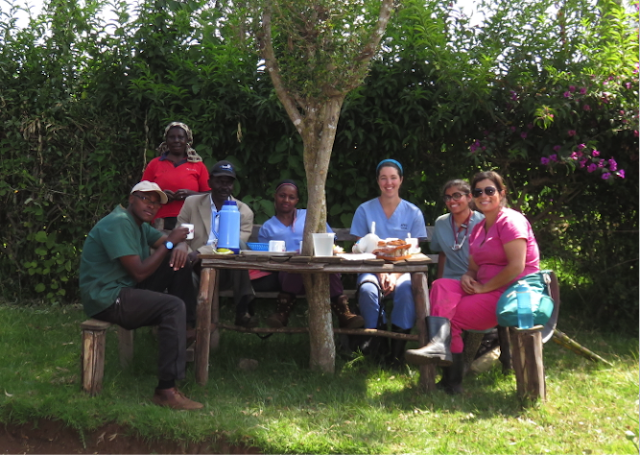 Seeing the Naari side was a great cultural and veterinary experience for me, but I am glad to be back in Mukurweini for the last few weeks of the project. 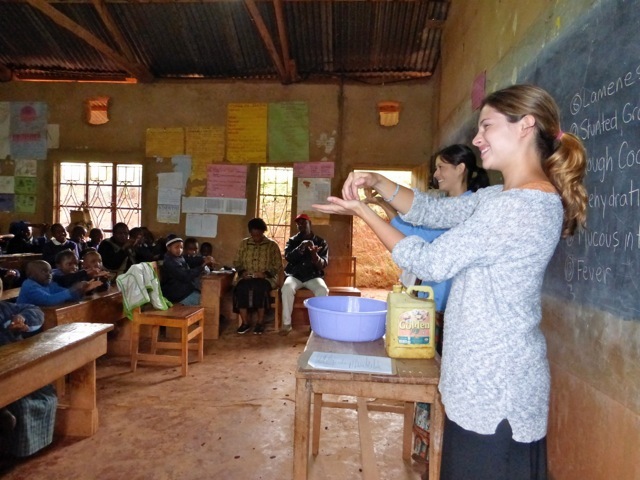 We have continued our visits to nutrition study farms. The weather has been cold and rainy, making for very muddy and slippery roads. 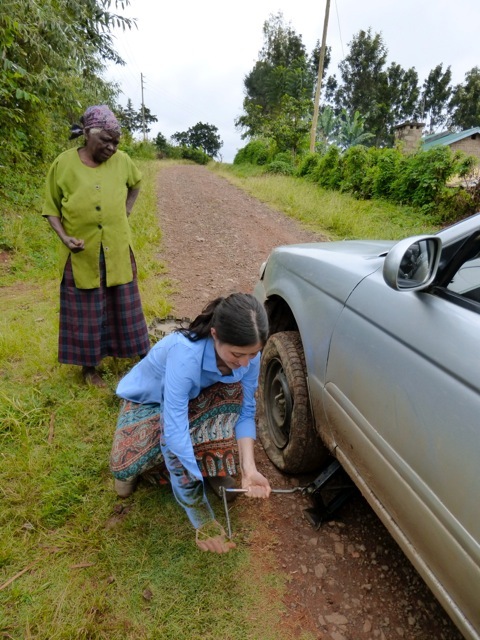 We have had to hike to some farms and push our car out of the mud a few times! And we occasionally got a break from the peanut butter and jelly sandwiches. 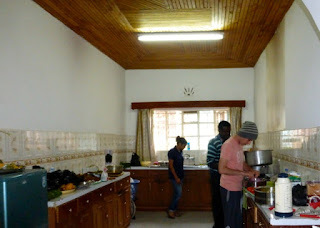 Our chef, Samuel, made us some veggie sandwiches for lunch one day, which we very much enjoyed. Unfortunately, our driver, Jeremiah, was not a big fan of the green, leafy stuff. 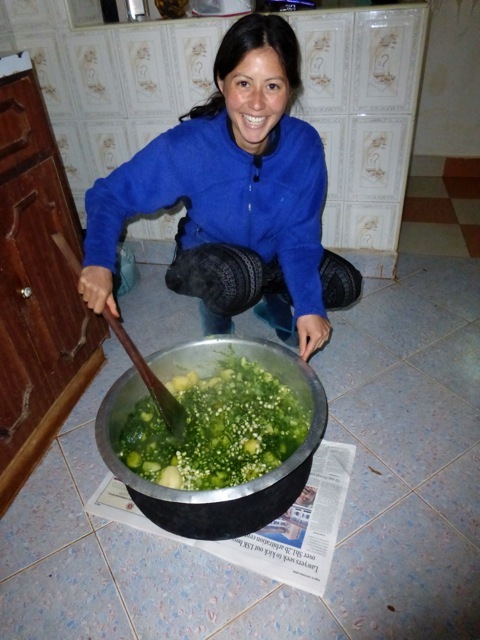 Priscilla, our translator, really enjoyed watching Jeremiah’s face as he attempted to finish the last of his sandwich! 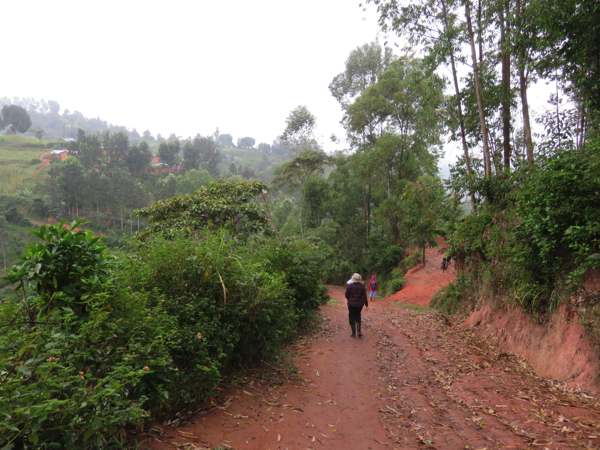 Walking to a farm near Mukurweini. I am excited to see the project wrap up successfully as we near its end. 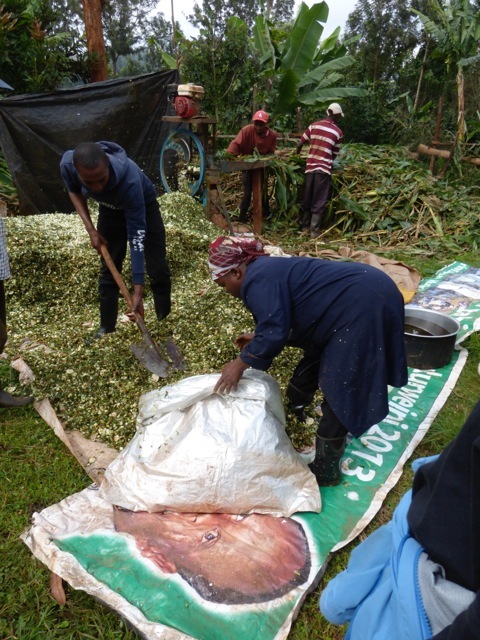 We have received positive feedback from the farmers and the dairy, and I am so glad that the work we have done here has benefitted the community. I have really enjoyed my time in Kenya, and I am already dreading the time when I will have to say goodbye to our Kenyan friends and families. 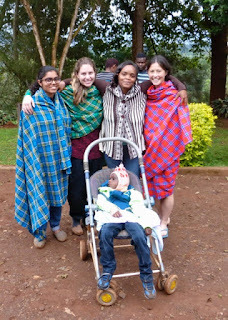 This amazing experience has been life-changing and humbling, and the generosity and hospitality of the Kenyan people has been second to none! It’s been a while since I wrote a blog…And so much has been going on I don’t even know where to start! Over the last 10 days or so, we’ve had an opportunity to spend some time with the highschool students who are here from PEI. We spent a morning with them at sports day at Buuri Secondary School, which was a lot of fun even though we were definitely not wearing the appropriate footwear! They also came out with us to visit a few local shambas and get a taste of how farming is done in Naari. 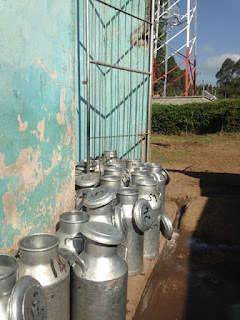 And yesterday we went with them to the Naari Dairy Co-operative and Geoffrey gave us all a tour of the facilities there. The students all seem very enthusiastic about all of it and asked lots of good questions at the dairy. They appear to be having a great trip and making the most of the amazing opportunity! Work has been going very well, we have only a handful of farms left to visit for the study, and then a few “freebies”. Over the last few weeks we’ve had a rotation of students from the other project staying with us, which has been very fun, plus it means Krista and I get to relax while the new girl does blood draws and palpations! 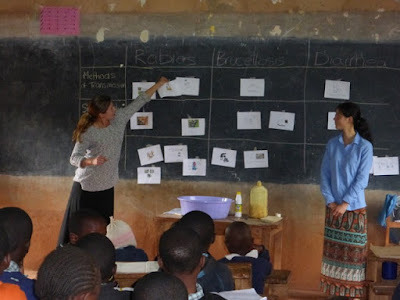 While Mira was here, we went on an adventure to the Lewa Conservancy to visit one of her friends who lives there. The directions we had to go on were the most amazing I’ve ever seen, and included instructions like “left 100m after euphorbia hedge” and “past more farms/rocks/s**t, turn right”. Obviously, we got very, very lost and it ended up taking us 3 hours to get to the house. Took us 20 minutes to get home. 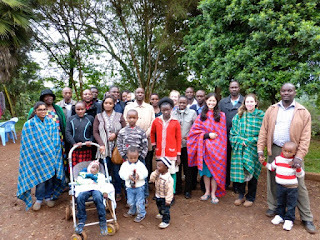 But the conservancy was gorgeous, and the people were lovely. We got to go for a swim in a spring while baboons played in the trees overhead! Even the drive was nice because it meant we got a great tour of the area! Sarifa has visited us twice, and we’ve had a great time with her. She and I both bought milk cans from the dairy to take home as souvenirs, and I have to say that it was the best shopping experience I’ve ever had! We got to climb on the pile of feed sacks to reach the top shelf where the cans are stored. Talk about shopping till you drop! Last weekend she was here and we all went with Salome, a FHF employee, to see a waterfall and suspension bridge in the Ngarendare forest. The water in the pool at the base of the falls was a beautiful silty blue and the falls were amazing. The park ranger told us that elephants visit the pool by sliding down the hills on their rumps. I was really hoping an elephant would come out of the woods and demonstrate, but no luck! And the suspension bridge through the treetops gave us a wonderful view of the surrounding area. At the end of the day we drove back through the Lewa Conservancy and pretty much had our own mini safari! We saw giraffes, zebras, antelope, and even a rhino way off in the distance! Our guide had incredible eyesight and could spot animals so far away that they looked like little specs of dirt on the window to me! And to top off an incredible day, we went to Jennifer’s for a sleep over and a delicious dinner with the group of high school students visiting from PEI. Sarifa left this morning and Maggie was dropped off. As yet, we haven’t had any super exciting occurrences during Maggie’s stay, but I’m sure that will change! We did manage to visit 4 farms today and all the farmers were very generous. The first gave us a chicken (our fifth this summer!) which we then carried around for the rest of the day. The second fed us a very tasty lunch and tea, the third gave us hot milk (a first for me! ), and the last gave us more tea. We are all very well fed and appreciative! 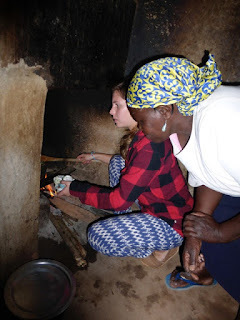 The last 10 weeks have been a whirlwind of new experiences and great adventures with wonderful people, I feel so privileged to have been able to meet so many amazing people and learn from them some small part of Kenyan culture, farming, and community. 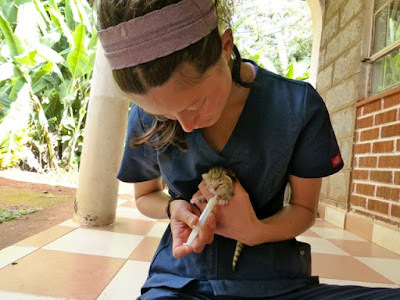 This is my last week in Naari, and I will certainly be sad to leave, but more adventures await and I’m very excited to visit Mukurwe-ini and see how things are done on the Vets Without Borders project! !